As world leaders gather in New York this week at the U.N. headquarters, a Michigan congressman is inviting Americans to join a social media campaign designed to draw attention to a former Marine sergeant who has been held prisoner in Iran for two years. 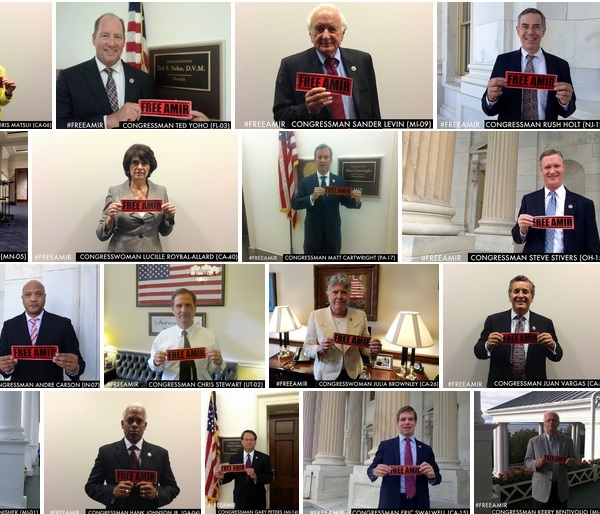 About 70 members of Congress have taken photos with a #FreeAmir sign in order to draw awareness to the case of Amir Hekmati, a former Marine held prisoner in Iran. Rep. Dan Kildee, D-Mich., represents Hekmati’s district and encourages all Americans to take a similar photo and share it on social media. Rep. Dan Kildee, a Democrat from Michigan, is working to boost global awareness of the imprisonment of one of his constituents. 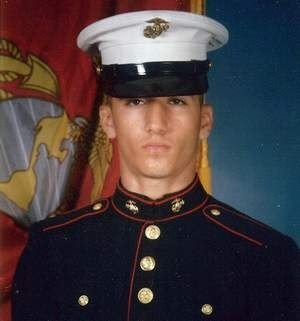 Former Marine Amir Hekmati has been held prisoner in Iran for two years. Kildee is encouraging members of Congress to have their photos taken with a sign that says “#FreeAmir” and share them on social media — so far, about 70 members of Congress have done so. Kildee’s efforts are timed with the first visit Iran’s new president, Hasan Rouhani, will make to the U.S. He hopes Iranian officials will see the campaign and know the world is watching, he said. 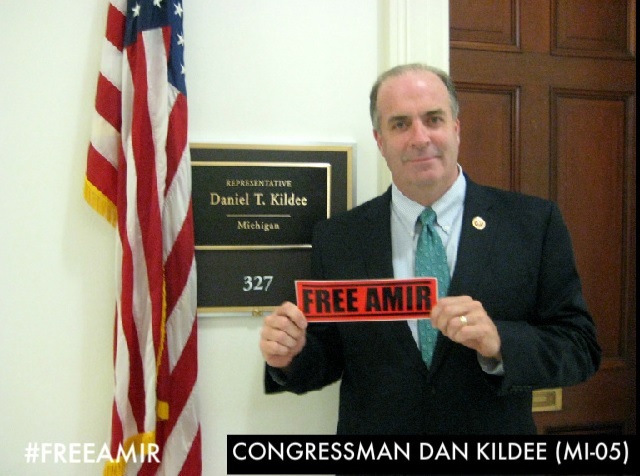 Rep. Dan Kildee, D-Mich., with a #FreeAmir sign outside his congressional office. Kildee represents Amir Hekmati’s district. “The idea is to make sure the Iranian government and officials who are here in the U.S. and clearly follow social media, know that the American people and their representatives are engaged in Amir’s case and are watching Iran as they deal with this case going forward,” Kildee said. Releasing Hekmati is a tangible step Iranian leaders can take to prove their seriousness as they try to engage the global community, he said. Iranian officials announced today that 80 prisoners who were arrested during political crackdowns in that country have been freed. Last week, it was announced that 11 others were released. Kildee said releasing the American prisoners would be a step in the right direction for Iran. Hekmati was arrested and tried on the grounds he was spying in Iran during a 2011 visit to see his grandmother. He was held in solitary confinement and at one point, faced the death penalty — a decision that was since overturned. He has had little contact with his family, and his father has since been diagnosed with brain cancer. On Sept. 1, he wrote a letter to Secretary of State John Kerry detailing miserable prison conditions. Kildee said Hekmati was brave to write to Kerry because, while he wants to be free and come home, he wants to be sure it’s not at the expense of his own integrity or that of the U.S. Representing Hekmati’s district in Michigan, Kildee said he’s always hearing from people who want to know how they can help his cause. He encourages Americans to take their own photos with a #Free Hekmati sign and share them on social media.